Fields: "Having one national standard for fuel economy is really important." 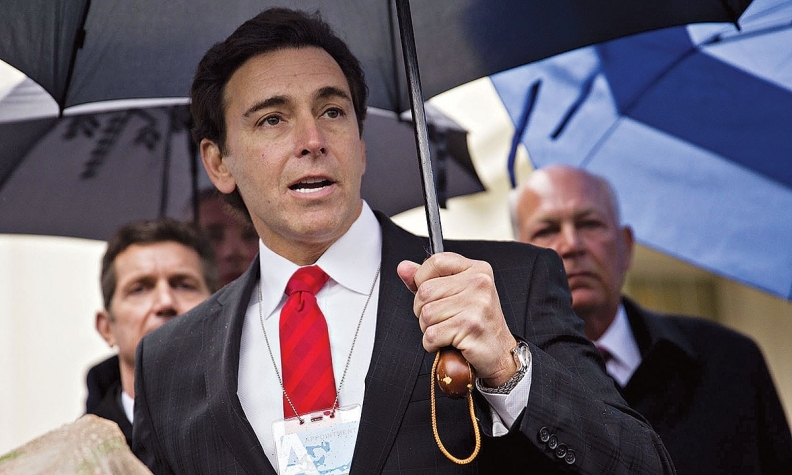 DETROIT -- Ford Motor Co. CEO Mark Fields’ total compensation jumped 19 percent last year, a regulatory filing by the automaker showed. His total compensation was $22.1 million, up from the $18.6 million he made in 2015, according to the company's annual shareholder proxy statement, released Friday. That includes a $1,787,500 base salary, a $2,736,000 million cash bonus and $14,298,356 worth of long-term stock and performance-based equity awards, making the value of the compensation awarded to Fields during the year -- excluding changes in pension value and other costs -- $18.8 million, up 8.4 percent from the prior year. Part of the raise included a leap in pension values from $858,157 last year to $2.8 million this year. Pension values vary year to year and change based on factors Ford does not control. Ford last year also spent $288,965 on Fields’ use of a private airplane. Executive Chairman Bill Ford’s total compensation rose 7.8 percent to $13.9 million last year, from $12.9 million in 2015. That included a $1,625,000 base salary, $760,000 in bonuses and $8.7 million in long-term stock options. The automaker spent $189,489 on Ford’s use of a personal aircraft and $898,066 on security for him. Joe Hinrichs, president of the Americas, made $6.7 million in total compensation, up slightly from the $6.4 million he earned in 2015. His awarded compensation, including a base salary of $1,053,500, came to $5.8 million, down 4.7 percent from $6.1 million a year earlier. Jim Farley, president of Europe, Middle East and Africa, received total compensation of $6.6 million, up 14 percent from $5.8 million in 2015. That included a $918,750 base salary, $949,050 in bonuses and $3,597,900 in long-term stock awards. CFO Bob Shanks’ total compensation rose 13 percent to $6.3 million from $5.6 million a year earlier. That included a base salary of $858,000, $656,640 in bonuses and $3,793,207 in long-term stock options. Last year, Ford Motor hit on 76 percent of its targets for executive bonuses, compared to 113 percent in 2015, the company said. Much of that drop is due to a decrease in its quality targets. Ford hit 52 percent of its quality goals in 2016, down from 118 percent in 2015. Ford measures quality in three phases: things gone wrong at three months of ownership; customer satisfaction at three months of ownership; and warranty spending per business unit. Ford would not break down each segment’s performance, but said its North American performance on things gone wrong was similar in 2015 and 2016, but the company had set more stringent targets for itself last year. Ford’s annual shareholder’s meeting will be May 11, but this year it will be virtual. Normally the meeting has been held in Delaware, where the automaker is incorporated. Shareholders will be able to listen, vote and submit questions from their homes or any remote location with internet connectivity. On the agenda again is a shareholder proposal to end Ford’s two-tier class stock system, which allows family members to maintain control of the company. Ford earned a $10.4 billion pretax profit last year. It expects to make about $9 billion this year.